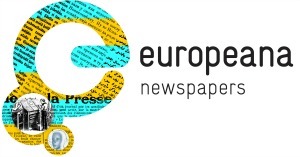 Every month we highlight one partner of the Europeana Newspapers Project. These articles will give you the ‘inside story’ about our partners, their specific role within the project and the various challenges that arise with the refinement and aggregation of historical newspapers. This month we feature the National Library of Latvia. 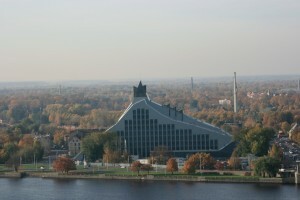 The Castle of Light, the new home of the National Library of Latvia. Founded in 1919, the National Library of Latvia (NLL) holds the largest collections of books, serials, maps, and sheet music in the country. It is both Latvia’s legal deposit library and a significant academic library. The NLL is also a competence centre for the library system and the driving force behind country’s major literacy and reading programmes for children and young adults. In addition to these roles, the NLL is heavily involved in a range of challenges and events. In 2014, its collections and staff will relocate to a new library building, known as the Castle of Light. This impressive structure, designed by renowned architect Gunnars Birkerts, is both technologically smart and architecturally impressive. Next year, the library will also how major events being organised as part of Riga’s role as the European Capital of Culture 2014. In 2015, the NLL will be the office and meeting site for the Council of the European Union during Latvia’s presidency. A newspaper from the collections of the National Library of Latvia. Digitisation is another major area of work for the NLL. It has been developing a National Digital Library for the past decade. 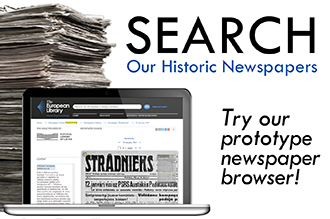 The first digitisation project was launched in 1999, with about 2 million digitised pages of historical newspapers. Thanks to funding from the European Regional Development Fund, more than 700 titles of periodicals and 7000 books were also digitised. A new portal for digital collections and enhanced user interactivity was also made possible through this project. Newspapers and magazines have always been an important source of data for historians – more so in Latvia where the process of reconstructing and rethinking the history after the World War II is still underway. The history of Latvian periodicals mirrors the nation’s turbulent history, from the first national awakening in the 19th century until the regaining of freedom in 1990. During the Soviet era (1945-1990) the operation of public media (along with all other kinds of publishing) was subjected to censorship. It was the press, however, that carried through the message of freedom at the end of the 1980s. Latvian newspapers vividly demonstrate that periodicals are not mere chroniclers of the passing scene. They can bring about or suppress the social and political change. In the first years after regaining independence, retelling the political history of Latvia seemed the most urgent matter. Society and researchers alike rushed away from the Soviet lifestyle, culture, literature, art, fashion, and even cuisine as if they did not want to know about it ever again. Recently, however, researchers have once again begun to analyze the cultural heritage, literature, art, criticism, and everyday life of the Soviet era. Newspapers are more than just articles. These are beautiful illustrations on the cover of one newspaper that has been digitised by the National Library of Latvia. Moreover, since the early 1990s researchers in humanities were eager to adopt various theories and trends that, despite being widely-known and influential in Western world, were virtually unknown in the Soviet cultural setting. This includes a keen interest in history, from social and private history to contemporary folklore, the history and sociology of sexuality, gender studies, et cetera. Interest in digitised periodicals is also on the rise, thanks to the rich, multilayered material periodicals can provide and the new browsing and searching possibilities of digitised materials. Recently a new, promising programme for history teachers was initiated, using the resources of the Latvian National Digital Library and Europeana to teach the history of Latvia and the world. 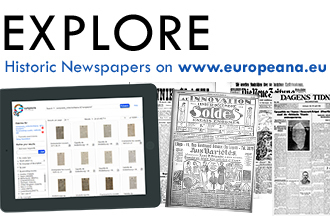 Europeana Newspapers will allow the NLL to process about 100 titles of periodicals, and to apply Optical Character Recognition (OCR) to those titles. 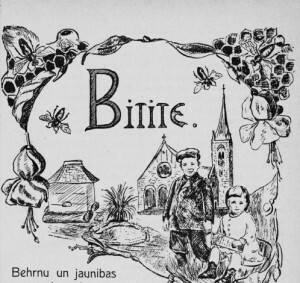 Most of these are from the early 20th century, which is also the time when the independent country of Latvia was born (Latvia became an independent country in 1918) and this in turn means that these periodicals will provide unique insight into the birth and development of modern-day Latvia. The periodicals being contributed include both traditional, daily newspapers and official government-published collections of laws and orders. One of the most important newspapers provided is Jaunākās Ziņas (roughly translated as “The Most Recent News”). 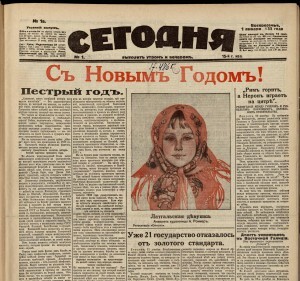 This was probably the most influential and widely read daily newspaper in 1930s Latvia. Another important newspaper NLL will provide is Valdības Vēstnesis (translated as “The Government Herald”), which contains every law and order issued by Latvia’s government. Although only 3 years of this periodical will be processed (1918-1920), these are also the first 3 years of Latvia as an independent country. Different typefaces can present digitisation challenges. Most of the newspapers provided by NLL will be in Latvian, but because of Latvia’s dynamic history at the beginning of 20th century, many newspapers will be in Russian and German as well. 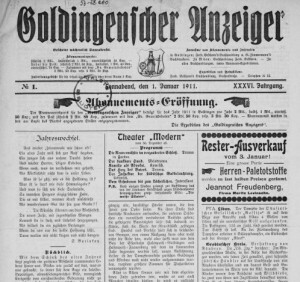 These newspapers might be especially interesting to researchers of World War I and World War II as different ideological view-points on these topics will be represented. One challenge of this digitisation work is the typeface. Many of the newspapers held by the NLL were published in Fraktur typeface, which has always been more challenging to process than Antiqua. 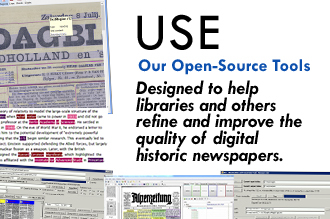 However, the first samples of the NLL’s newspapers (processed at the University of Innsbruck) have resulted in a high-quality digital version (including OCR), even for the older texts. You can see more images from the National Library of Latvia’s newspaper collection on the Europeana Newspapers Flickr stream. This entry was posted in Featured Partner and tagged digitisation, latvian national library, newspapers by eurnews. Bookmark the permalink. Please inform me about the possibility of reading the newspaper “Segodnaja” in digital form.